Here's another piece of art created to be used to make iron-ons during the early Turtle days. This one I did all by myself. That is an awesome picture, too bad it wasn't made into a poster. 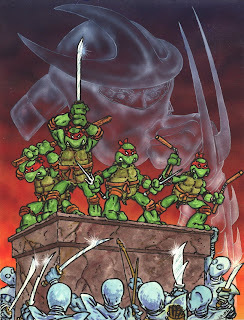 Can you still use this for maybe another reprint of TMNT #1 or anything really? I love this piece, a lot. I agree. I love this one too. -->> ..pretty classy, classic and proficient as well.